Danica Patrick just can’t win for losing. The Stewart Haas Racing driver started her weekend at Sonoma Raceway is encouraging fashion; qualifying sixth for Sunday’s running of the Toyota/Save Mart 350. But as soon as the green flag waved, Patrick’s luck turned sour. Just 14 laps into the event, Dale Earnhardt, Jr. spun in Turn 11 and slid his Axalta-sponsored Chevrolet across the track, into the path of Patrick’s oncoming Ford. 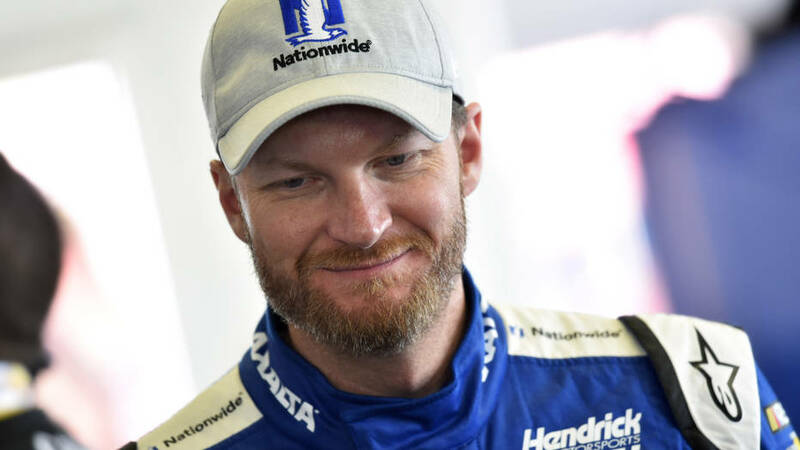 "Wrong place, wrong time," explained Earnhardt afterward. "Danica was trying to protect her position, and I went even lower than we normally go. It's real slick down there, and I just locked up the rear tires. I'll take some of the responsibility, for sure." Patrick sang a similar tune, saying Earnhardt, “kind of lost it. “I went to the outside, and there were cars all slowing down ... and he spun across,” she said. “There was a lot of dive-bombing today… but there's a limit to the amount of grip and the amount of braking power that these cars have." The impact damaged both machines, and crew chief Billy Scott called Patrick to pit road for repairs and fresh tires. The Code 3 Associates driver quickly worked her way forward from the back of the pack, however. climbing as high as 21st before a scheduled, green-flag pit stop on Lap 22 for tires and fuel. Not long after the start of the race’s second stage, Patrick once again found herself in the wrong place at the wrong time. This time, Kyle Larson attempted a three-wide, banzai move that ended with a second round of contact with Earnhardt. Patrick went spinning into the path of boyfriend Ricky Stenhouse, Jr., who was left with nowhere to go. "Tell Ricky I'm sorry," said a sheepish Patrick, after Stenhouse suffered sufficient damage to end his day. Patrick was able to continue, once again pitting for tires and repairs. She began the race’s final stage in 18th place, and ran as high as fourth as the field cycled through a series of green-flag pit stops. 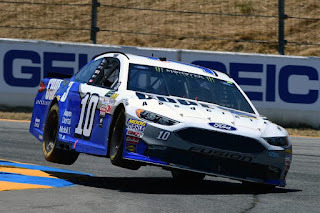 She dropped to 28th after a final pit stop on lap 80, before racing her battered Ford back through the pack to finish 17th at the drop of the checkered flag. “It definitely wasn’t the day the Code 3 Associates team was expecting,” said Patrick of her pinball-esque afternoon. “But we were able to battle back to a decent finish. The car was just awful in the final laps of the last two runs, but we made the most of it at the end. "It's just a lot of people dive-bombing” she added. “It's part of what makes road-course racing exciting in a stock car, because you don't climb wheels. You just bump fenders. It just wasn't the day we expected to have. In the aftermath of Sunday’s outing, Patrick now stands 28th in the championship standings. Her only shot at a 2017 playoff berth is to win a race in the next few weeks; an unlikely prospect considering that she is winless in 233 career stock car starts, and has recorded just one Top-10 finish – a 10th at Dover earlier this month – in her last 78 races. When Patrick first came to NASCAR in 2010, fans and media stood 30-deep around her car and radio and TV clamored to interview her before and after every race. Sponsorship flowed like water, and Patrick ranked as one of the sport’s most recognizable drivers. Since then, however, the hype has cooled. A half-decade or more of mid-pack finishes has made Patrick less relevant to the media and less attractive to sponsors these days, and the rumor mill is rife with speculation that she will not return to Stewart Haas Racing next season. Patrick has openly admitted “not having fun” on the race track this season, adding that if her performances don’t improve, she may look for something else to do on Sunday afternoons. Patrick certainly isn’t in it for the money. She has been well compensated throughout her IndyCar and NASCAR careers, and recently published a health and fitness book, “Pretty Intense.” She launched her “Warrior by Danica Patrick” line of fitness apparel earlier this year to rave reviews, and admitted that if her on-track fortunes do not improve, there could be a team change – or even a career change – in her near future. “It could mean either, to be honest,” she said. “If I could do better with a different team, then I would do it. I love racing. But I don’t love being miserable every weekend like I am now. With just 10 races remaining in the 2017 regular season – 10 more chances to regain her on-track relevance – Danica Patrick stands at a career crossroads. If her performance continues to flounder, 2017 will almost certainly mark her final season with a top-tier NASCAR team. A little luck would certainly help change that outlook. Today is the fourth anniversary of the day former NASCAR Sprint Cup, Nationwide and Camping World Truck Series driver Jason Leffler lost his life in a savage Sprint Car crash at New Jersey’s Bridgeport Speedway. Our eulogy for "LefTurn" remains one of the most-read articles in the history of GodfatherMotorsports.com, and we re-post it today in memory of our friend Jason. He is gone, but not forgotten. Charlie Dean Leffler’s daddy died last night, torn from the world in a crash so stunning, so horrific that it once again causes us to question our devotion to a sport that all too often breaks our hearts. NASCAR driver Jason Leffler was pronounced dead shortly after 9 p.m. Wednesday, after a grinding crash at New Jersey’s Bridgeport Speedway. Witnesses said his 410 Sprint Car impacted the Turn Four wall during a qualifying heat race and flipped wildly down the front stretch of the 0.625-mile dirt oval. Safety teams extricated the unconscious driver from his vehicle, with plans to transport him to Cooper University Hospital in Camden. His condition deteriorated rapidly while awaiting arrival of a medivac helicopter, however, and responders elected to transport him by ground ambulance to nearby Crozer-Chester Medical Center, where efforts to revive him were unsuccessful. As word of the crash began to circulate, I did what I always do in situations like this. I told myself that the reports were untrue or exaggerated; the sad result of internet hysteria and a public raised on reality TV. When it became clear that a serious crash had indeed occurred, I prayed that Leffler’s injuries were not severe, assuring myself that he would back in the cockpit in a few weeks, or months. Just before 10 p.m., however, a phone call from a colleague brought the horrible reality home. Jason Leffler was dead, leaving us to mourn – and remember --once again. I have so many memories of the man we called “LefTurn.” He was a weekly guest on our Sirius XM Speedway radio program for years, sharing his life – both on and off the track – with a degree of candor that was both refreshing and rare. There were plenty of good days; wins in both the NASCAR Nationwide and Camping World Truck Series, championship-contending rides with elite owners like Joe Gibbs and Chip Ganassi, and a trio of runs in the legendary Indianapolis 500. There were also a few bad days; crushing race-day defeats, championship shortcomings and the loss of his Nationwide and Truck Series rides. When he and Alison decided to end their marriage a few years ago, Leffler made his weekly appearance as scheduled, despite a heavy heart. In the months that followed, Leffler spoke constantly of his desire to be a loving and involved father to Charlie, despite the demands of his racing career. Our weekly, 4 p.m. conversations often coincided with the end of Charlie’s afternoon nap, and the unpredictability of a newly-awakened two-year old made our visits an absolute joy. A year ago, I crossed paths with Jason and Charlie, sharing a “Boys Day Out” lunch at a local restaurant. While Jason and I talked racing, Charlie demolished a massive salad, shoveling huge forkfuls of lettuce into his mouth while simultaneously carrying on a silent flirtation with my wife. How do you tell a five-year old boy that daddy is not coming home tonight? How do you explain that his father, his best friend and his hero – all rolled into one – has been cut down by a sport that exacts such a horrible toll from its brightest lights? The loss is unfathomable, unacceptable and unbelievable. Today, I mourn the loss of a phenomenal talent; a man who could run an entire, 10-lap heat race at the Chili Bowl Midget Nationals on three wheels, his left-front tire twitching in mid-air in an awe-inspiring display of chassis-bending bravado. I mourn the loss of a friend whose zest for life, winning smile and goofy, faux-hawk hairdo never failed to make me smile. I mourn the loss of a father who adored his son and deserved to see him grow up. All sports include a varying degree of risk, but auto racing is especially adept at destroying its own. Racers have a special relationship with death. They brush shoulders with it daily, acknowledging its presence with a passing nod while clinging stubbornly to the belief that it’ll never happen to them. “Last year, I did a part-time truck deal,” said Leffler to Motor Racing Network’s Winged Nation recently. “It was the least I had raced since I was 18 (and) mentally, it wasn’t good. I don’t like being home. I just like being in the race car at the race track. 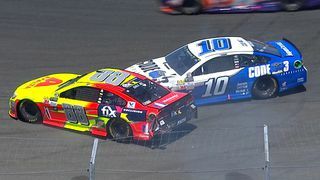 Big-league NASCAR racing had not suffered a fatality since the great Dale Earnhardt crashed to his death on the final lap of the 2001 Daytona 500. In that time, SAFER barriers, HANS devices, improved helmet and seat technology and car construction have made the sport safer than at any point before. But make no mistake about it, auto racing is not safe, and it never will be. As long as men and women strap themselves into objects capable of eclipsing 200 miles per hour, as long as they test the boundaries of human endurance at places like Daytona, Lemans, Winchester and Bridgeport, horrible things can – and will -- happen. Until the laws of physics are repealed, the immovable force will always trump the unstoppable object. And when it does, racers will die. Jason Leffler knew that. We all knew that. But it doesn’t make what happened Wednesday evening any easier to accept. Sunday was not the greatest day of Darrell “Bubba” Wallace’s racing career. 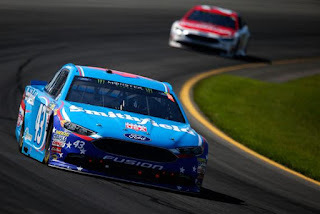 A trio of pit-road speeding penalties relegated him to 26th place in Sunday’s Pocono 400, his inaugural Monster Energy NASCAR Cup Series start in “King” Richard Petty’s iconic No. 43 Ford. 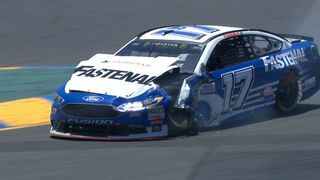 After his imperfect Pocono outing, Wallace became lightheaded and fainted on pit road, before being treated and released at the track’s Infield Care Center. “Heck of a way to end it, passing out,” joked Wallace, who became the first African-American driver to compete in NASCAR premier series event since Bill Lester in 2006. "It has happened three times now where I’m just so mad that I pass out." 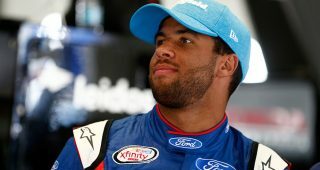 The 23-year old Alabama native drove in place of Aric Almirola Sunday, after Almirola suffered a broken vertebra in a crash at Kansas Speedway last month. And earlier in the weekend, he spoke at length about the opportunity, admitting that he is conscious of the role he plays as an African American driver in a predominantly white sport. Wallace said he has never been deterred by the lack of minority drivers in NASCAR, adding, “I started out in the sport because it was something fun and new for me. I never even paid attention to see if there was anybody that looked like me growing up in the sport. He said he ignores the continued presence of Confederate flags in the track’s infield each week, adding, “The only flags I see are green, white and checkered. “I think that goes back to my parents, teaching me at a young age to never see it as black and white. Everybody's equal. Everybody deserves the same opportunity, the same challenge. Everybody should live their lives to the fullest with no hassles, no hold‑backs, no matter what age (or) what color you are. We should have no barriers on what we want to do in life; no matter your color, your age, gender, disabilities, no matter what. It's something that should be taken care of. “I've hit a couple barriers growing up. There's definitely been some flak in the way. I would get the gestures and everything thrown out, (then) we'd show up the next weekend and win. That's how I was taught. My mom and dad always told me to block out the bad and take the good, use it as motivation. 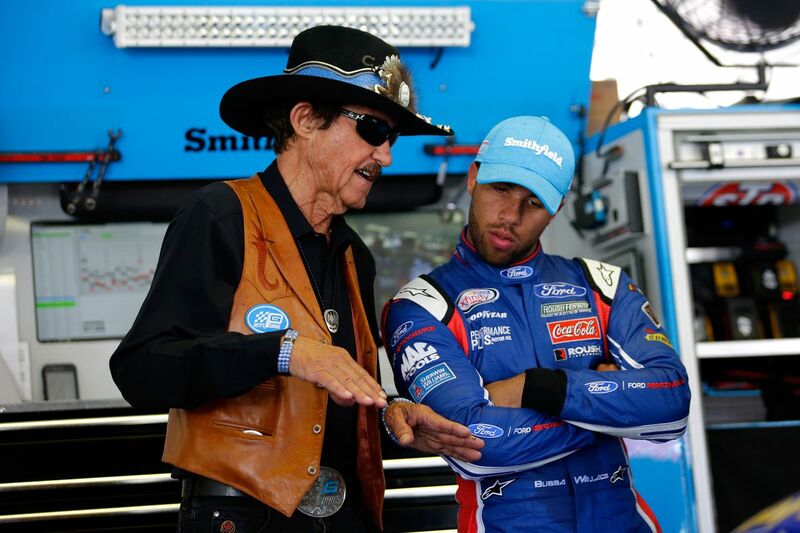 Wallace said he spoke recently with the family of NASCAR Hall of Famer Wendell Scott, who broke NASCAR’s color barrier decades ago with 495 starts and a single win in NASCAR’s premier series. Asked about his inability to attract full-time sponsorship in NASCAR’s Xfinity Series, Wallace pointed to his won/loss record, rather than the color of his skin. The Alabama native admitted he has no idea what his future holds, once Almirola is cleared to return to competition. “I can't really touch on that, because I don't know what's going to happen,” he said. “One thing I can touch on is I know I'll go out there and prove to everybody -- inside the racetrack, outside the racetrack, on TV -- that I belong in the Cup Series. I’ll do the best that I can, give an extra 200% each and every time I climb in the car for Ford, for Richard Petty, for everybody on the team (and) for Smithfield. While admittedly feeling the pressure of his first MENCS opportunity. Wallace said he is also taking time to enjoy the moment. “(Eventual Pocono winner) Ryan Blaney texted me this morning -- actually woke me up this morning-- and he wants a picture this weekend. He was like, ‘We're driving the two most iconic cars in the sport this weekend. We definitely have to capitalize on that. 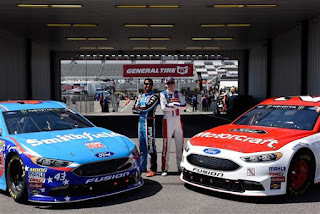 By the time Almirola returns, Wallace will rank second to Scott on a regrettably short, eight-man list of African American drivers to compete in NASCAR’s top series. But predictably, the Alabama native will remain focused on racing, rather than race. “I think everybody wanted to see this opportunity happen,” he said. “NASCAR wanted to see it, I believe, for multiple reasons. And Ford has been a great supporter of mine for the last two years, going on three years now. This has been a pretty big couple of days for me. It's an exciting opportunity, not only for myself but my family, my fans… everybody that's helped me get to this level ever since I started racing when I was nine years old. “I've been through 14 or 15 years of racing; a lot of ups and downs,” he said. “There's more downs than ups. That's what makes you stronger, keeps you hungry and coming back for more. It's been a lot of blood, sweat and tears; from not only myself, but everybody that's helped me out along the way. A lot of family sacrifices to get me here. Everybody has a different story of how they got to their ultimate level. It’s been one heck of a year to be a NASCAR inspector. With fewer boots on the ground than ever before due to budget cuts and layoffs, NASCAR’s foot soldiers are being called upon to do more than ever these days, in less time. An influx of new technology has required NASCAR’s officials’ corps to learn new ways of doing things, while guiding race teams through previously uncharted technical territory. And when things go wrong – as they frequently have – it’s the officials who take the heat when an over-aggressive crew chief gets caught with his hand in the proverbial cookie jar. 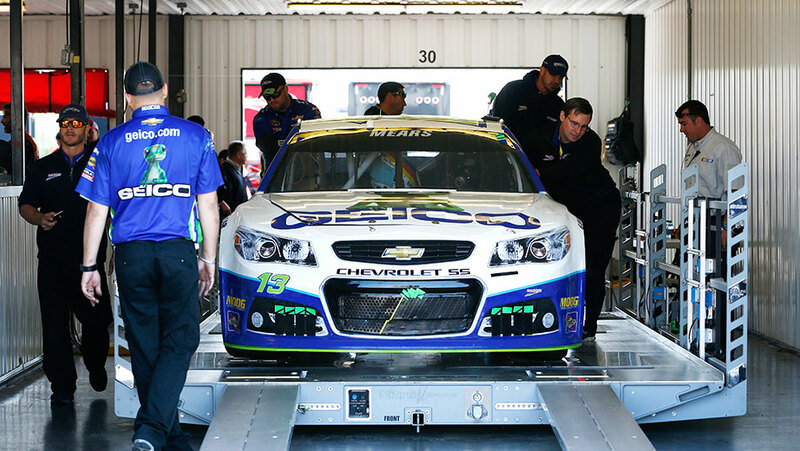 Numerous times this season, teams have been unable to make qualifying attempts after failing multiple pre-qualifying inspections. And when that happens, team members point the finger of blame in the direction of the sanctioning body, claiming that major adjustments on their machines produce little (or no) impact on the readouts. NASCAR has countered those allegations, utilizing a non-adjustable test car dubbed “The Lunar Rover” to perform multiple re-calibrations of their inspection machinery, each and every week. And yet, the accusations continue. Now, with 13 races in the record book – one half of the regular season schedule – it is possible to look back on the 2017 campaign and draw some cold, hard conclusions. A check of 2017 qualifying records shows that teams had no trouble passing pre-qualifying inspection at the circuit’s two restrictor plate races. 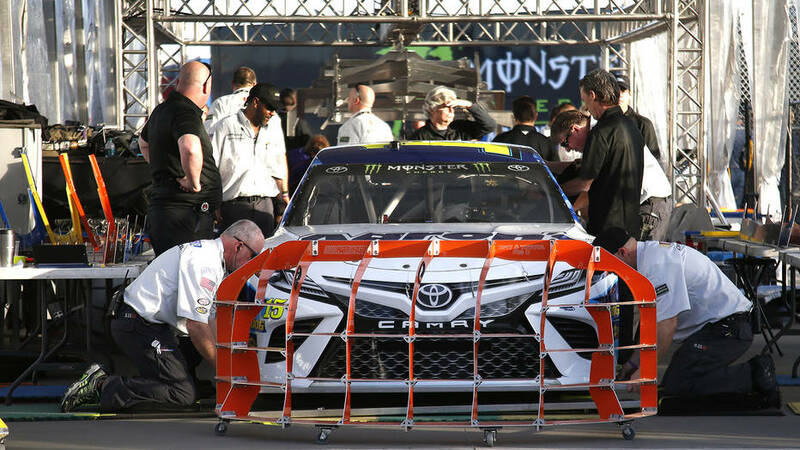 In the season-opener at Daytona International Speedway in February, all 42 drivers successfully completed inspection in time to attempt qualifying. That trend continued at the 2.5-mile Talladega Superspeedway on May 6, with all 41 drivers attempting to qualify, without incident. The series’ short track venues have been similarly devoid of pre-qualifying drama. Every driver made a qualifying attempt at Bristol on April 21 and Richmond on April 28, while qualifying was rained out at Martinsville Speedway on March 31, with the field set via the NASCAR rule book. The one-mile ovals have also been trouble free this season, with all drivers successfully navigating pre-qualifying inspection at both Phoenix (March 17) and Dover last weekend. It’s NASCAR’s intermediate tracks – the 1.5 and 2-mile ovals where aerodynamics are of critical importance -- where the issues seem to arise. At Atlanta Motor Speedway on March 3, Jeffrey Earnhardt, Michael McDowell, Cole Whitt, Derrike Cope and Cody Ware all failed multiple inspections and were unable to complete even a single qualifying lap. Three weeks later at Auto Club Speedway, Jimmie Johnson, Joey Logano, Trevor Bayne, Matt DiBenedetto and Gray Gaulding did not make qualifying attempts, after failing multiple inspections. Texas Motor Speedway saw nine drivers -- Kyle Larson, Chase Elliott, Kyle Busch, Kasey Kahne, Erik Jones, Dale Earnhardt, Jr., Chris Buescher, Timmy Hill and Derrike Cope – start at the back of the pack after failing to clear pre-qualifying inspection. Kansas Speedway provided the season’s low point, when a total of 12 drivers -- Johnson, Clint Bowyer, Kahne, Jones, Earnhardt, David Ragan, McDowell, Landon Cassill, Reed Sorenson, Corey LaJoie, Hill and Carl Long – were forced to start at the rear of the field after failing pre-qualifying inspections and being unable to turn a qualifying lap. 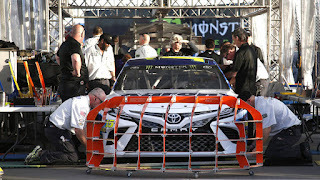 On All Star weekend at Charlotte Motor Speedway, all 16 drivers passed inspection in time to attempt qualifying for the Monster Energy All Star Race. However, Sorenson and McDowell both failed inspections prior to qualifying for the companion Monster Energy Open. One week later, Larson and LaJoie failed to pass pre-qualifying inspections at Charlotte and were forced to start the Coca-Cola 600 from the rear of the field. Interestingly, the only 1.5-mile track to experience no pre-qualifying issues was Las Vegas Motor Speedway, arguably one of the hottest venues on the schedule. 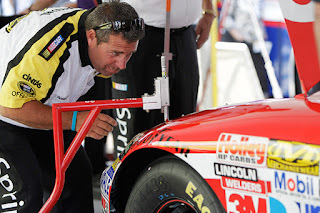 If NASCAR was truly experiencing equipment issues – with LIS tables and other measuring devices succumbing to the vagarities of heat and humidity – why have the issues occurred only at tracks where rear camber and skew offer the largest advantage? Shouldn’t there have been just as many problems at Martinsville, Daytona and Bristol, where the same measuring devices were used under the same varying weather conditions? And yet, no such issues occurred. In the absence of such across-the-board problems, regardless of the size of the venue, it is virtually impossible to blame the yardstick for this season’s inspection debacles. NASCAR’s LIS and template stations are inanimate objects, capable of neither human bias nor error. They don’t see names and car numbers; only concrete, indisputable measurements. Every car is the same as the others. It either complies with the rules, or it doesn’t. Chad Knaus had it right a few weeks ago when he said teams “have nobody to blame but themselves” for this season’s rash of high-profile inspection failures. So enough with blaming the yardstick. Enough pointing the finger at Mother Nature. It’s time to place the blame where it has belonged all along; with the men and women who live their lives in the gray area of the NASCAR Rule Book. "It's genetic. That's just who I am." 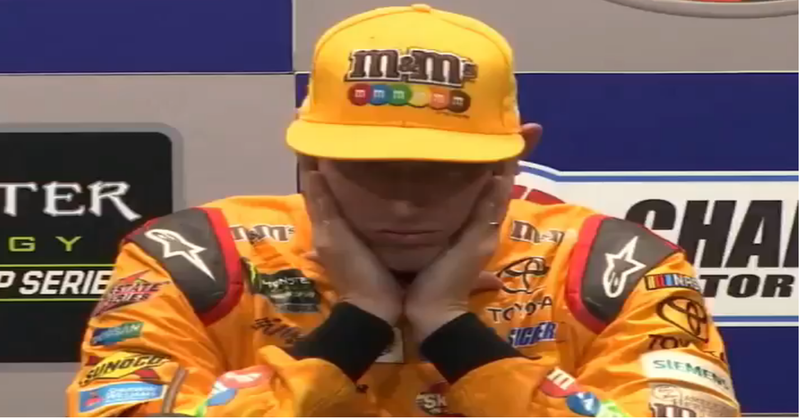 Kyle Busch says people should learn to accept his sometimes surly post-race demeanor. Not everyone in the NASCAR Garage agrees. Busch drew criticism from some corners two weeks ago, after a terse post-race press conference at Charlotte Motor Speedway where he gave a sullen, six-word answer about his runner-up finish to Austin Dillon in the Coca-Cola 600, before ending the session with an abrupt mic drop. Busch admitted that he is not the most gracious loser in the sport, but argued that after 13 years as a full-time Monster Energy NASCAR Cup Series driver, people should be willing to cut him some slack. “Different people show their emotions in different ways,”: said Busch. “And unfortunately for me, mine has never been very gracious. I don’t know that it ever will be. I’m learning that, as the days go on. My son is two years old (and) I see where that came from. It’s genetic. I’m sorry, that’s just who I am. That’s what I was given. If there’s anyone to blame, it’s probably the guy upstairs. “I can probably get better and go to training and classes… but I don’t know," added the 2015 MENCS champion. "It is the way it is. I’ve been fortunate enough to have been blessed (and) to be in the opportunity that I’m in. I’ve got great partners and sponsors that are with me, and they’ve stuck with me through a lot worse than what happened this week. Brad Keselowski, however, is having none of it. Keselowski was not deterred, however, and spoke out again last weekend at Dover, criticizing those who view Busch’s tempestuous personality as a reflection of his determination on the race track. Not everyone sees an issue with Busch’s post-race snit, however. Keselowski also said he strives to set a more positive example by conducting himself well, in both victory and defeat. "When I look at teams and people in this sport, they all want to be associated with those who have the strongest hunger and desire and passion to be successful,” he said. “That's natural. That includes myself. (But Busch’s) message to convey -- whether it's through the media or through different mouthpieces -- is a terrible message that has serious effects; not only on our sport, but on our society. “I don't think that's acceptable. Your desire to win can be expressed in a lot of other ways that are productive." 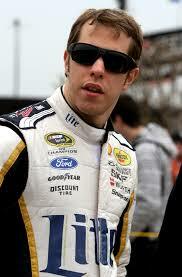 "(If) you want to show me desire and passion to win, it's when nobody is watching," Keselowski said. "That's what desire and passion is to win."